Is Spielberg planning a paranormal and UFO social network? According to several sources, (many gaining some or all of their information through TechCrunch’s website), rumours are spreading, that Spielberg is planning to start a social network, around the topics of the paranormal and UFO encounters/extraterrestrial phenomena. It seems the site will also have photos and video content, as well as other elements added too. However, can it add more to what already is out there? for instance, http://abovetopsecret.com ; i am not sure…. but if it goes ahead, then it might add something new, who knows. Of course, some critics have suggested that this could be used for some sort of viral marketing of his…. 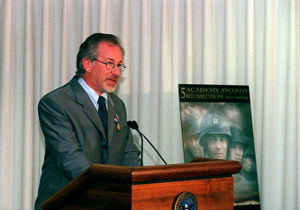 Steven Spielberg’s life can be found here .